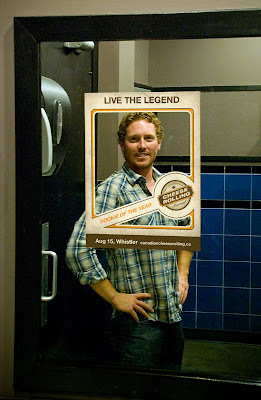 14 Creative Mirror Inspired Advertisements - Part 3. 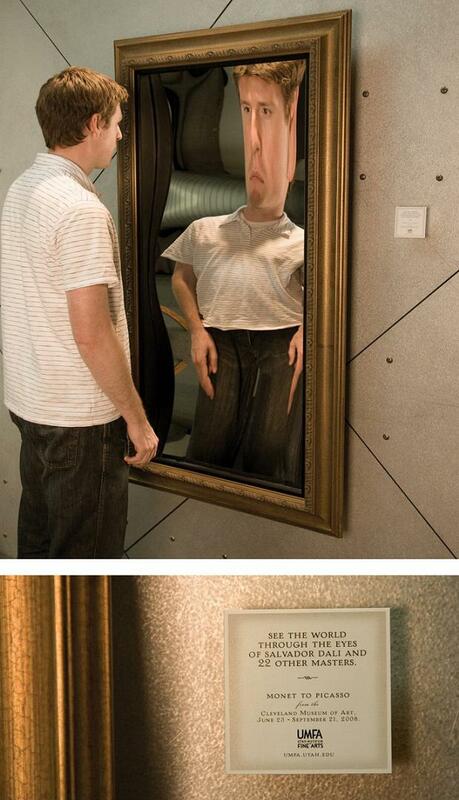 Creative advertisements inspired by mirrors by various companies from all over the world. Atelier do Corpo Facial Gymnastics Classes Mirror Advertisement: To promote the facial gymnastics classes of 'Atelier do Corpo', mirrors were placed in gyms, hallways and elevators of office buildings at Atelier office. As people approached these mirrors, they realized that it was mirror of distortions and they could interact, simulating the movements of the face made facial gymnastics classes. The Annual Canadian Cheese Rolling Mirror Advertisement: To promote Canadian cheese in BC, TAXI Vancouver these creative mirror ads were created. 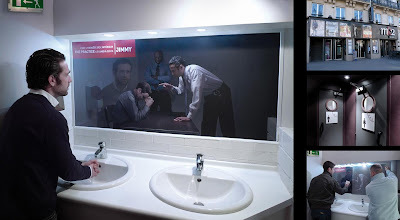 TV Channel Mirror Advertisement - 2: To promote a TV show a two-way mirror effect was created in theaters. Russian Drink Mirror Advertisement: Posters were placed strategically on the walls facing mirrors in bathrooms; the posters seemed to be in Russian. 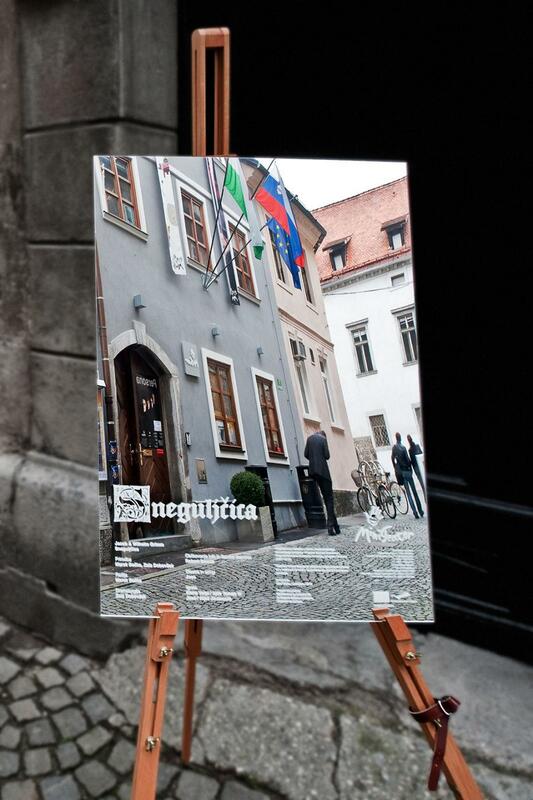 But when the viewers looked into the mirror, the Cyrillic letters were reversed to read in plain English. Bioder Mirror Advertisement: Convex mirrors were placed in shopping malls all aver Istanbul, Turkey to promote 'Bioder'. The person who stood in front of the mirror saw himself or herself slender. Esmaltec Appliances Mirror Advertisement: Mirrors were placed with stickers that looked similar to the stains of ketchup, mustard and coffee in dressing rooms, shopping malls and restrooms. These gave the impression that the dress needs cleaning, promoting 'Esmaltec automatic washing machine'. Sekunda Glue Mirror Advertisement: As most people are familiar with the feature of glue, but few have known how easy it is to repair a totally broken household object back. 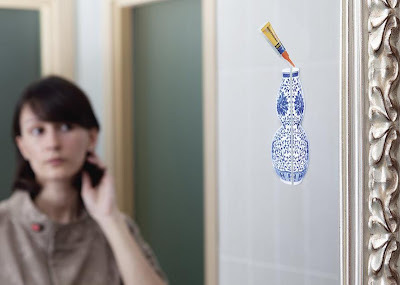 To promote 'Sekunda glue', small model scales of half porcelain objects found in households were placed on mirrors; the half plates, vases and cups looked as a complete new object highlighting the easiness of bringing your broken household object back to its original form. Foot Cream Mirror Advertisement: To promote the foot cream, posters were placed on full-length mirrors in shoe stores, shopping malls, and super markets. Mini Theatre Mirror Advertisement: Mirrors were used as a "poster" for a theatre play Snow white, performed by the Mini theatre - Ljubljana, Slovenia. Shiseido Mirror Advertisement: To promote a skincare product, three special mirrors were created; the women needed to upload their photos, she can then have a conversation with herself in 3D through the mirror. 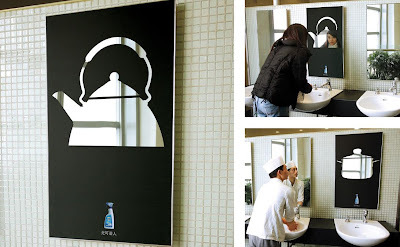 Pril Washing Liquid Mirror Advertisement: In place of the usual convex mirrors, shiny utensils were placed around sharp corners in parking spaces of commercial complexes, hotels and apartments in New Delhi, India. These utensils acted as an interesting reminder that Pril cleans the best. 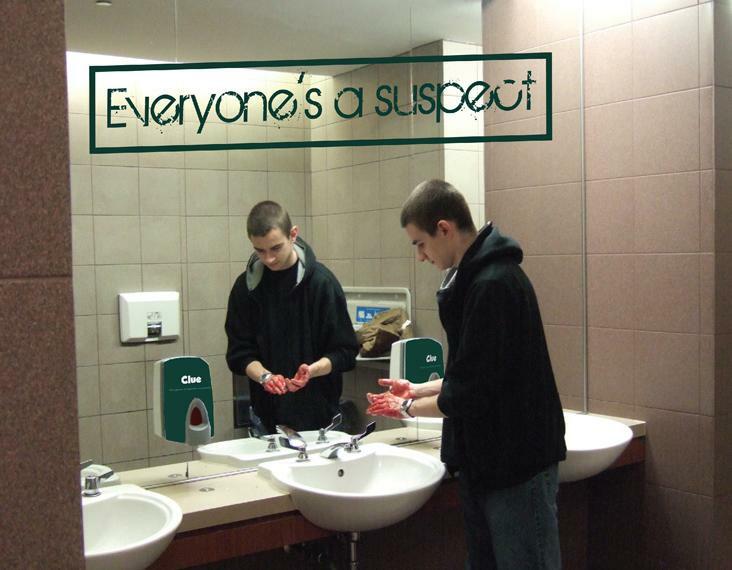 Clue Mirror Advertisement: Soap dispensers in washrooms in Toronto, Canada were filled with red colored soap along with a sticker on the mirror to promote 'Clue'. 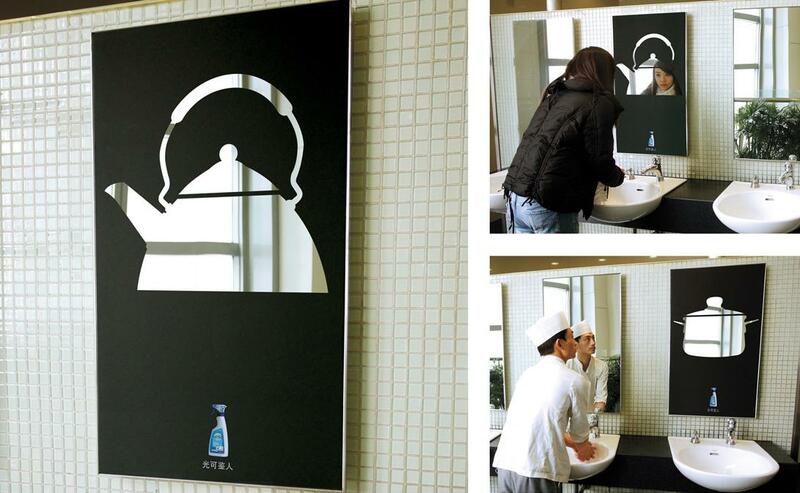 Tongda Detergent Mirror Advertisement: To promote 'Tongda Detergent' decals in the shape of stainless steel kettles were placed over the mirrors to emphasize the grease removing capacity of the detergent. Don't miss to check out "Creative Mirror Inspired Advertisements - Part: 1| 2| 3."